H alf of every business is creating something that people need. The other half is convincing people to buy it. We’re pretty sure you have plenty of ideas for the first part, so we tried to help you figure out the second one. This year, we took the task of seeing how several hundred startups approached the complex issue of pricing and identifying the best practices for you to learn from. We manually collected and curated data from 775 pricing pages, all belonging to SaaS startups and we created (probably) the most comprehensive pricing pages study. Below you can find some interesting findings from our study. Yet, for a comprehensive understanding of this matter, we advise you to check out the complete study. What’s in A Pricing Page? How Should You Structure Your Pricing Packages? What Prices Should You Go With? What About Enterprise & Annual Plans? Pricing Pages - Back to or Away from Basics? The websites we looked at are all SaaS startups (a business model which has a software as a service) that have been developed in the past five years and come from all walks of industries, from Digital Marketing to Hardware and Software, from Creative Industries to Data Security and from Lifestyle to Management. Some of these are well established, true-and-tried fields, others were the rising starts of the moment, while other still are niche, but likely to explode in the following years. Has it happened to you to cook something that looked incredibly easy to do and absolutely delicious (according to the 30 seconds Facebook video)? You followed the recipe step-by-step, did everything by the book but the result was something not even your hungry dog would try. Why is that? Because the result depends on way more elements than you might think: the ingredients, the cooking skills, your oven's quality, the material of the pot and so on. Same thing happens in pricing approaches. There really isn’t a general perfect pricing page recipe but you can craft your own successful pricing page. And to do that, you should definitely read our full study for loads of useful findings, good practices and inspiring pricing methods. Read the findings, figure out which practices to go by and which to throw out the window and come up with the pricing model that will most satisfy your customers’ needs, as well as your own! Read it carefully, find insightful answers to a series of important questions as the ones below, and you'll surely find Your perfect pricing page recipe. Which Industry Dominates the SaaS World? Should You Require Credit Card Info at Registration? Which Businesses Have the Cheapest Pricing Plans? Which Businesses Have the Most Expensive Pricing Plans? Do All Pricing Pages Offer Features Comparison? Do Businesses Hide Their Lowest Priced Plan? Do All Businesses Offer Discounts for Annual Plans? Are Companies Still Listing Their Phone Numbers? Do Websites Offer Currency Selection on Their Pricing Page? 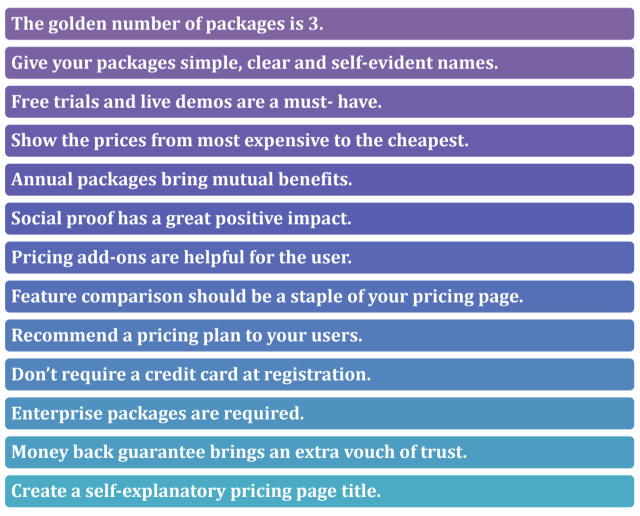 What Else Should You List on Your Pricing Page? When we talk pricing pages there’s one important clarification we need to make: despite its name, the main function of a pricing page might not necessarily be about displaying the price. 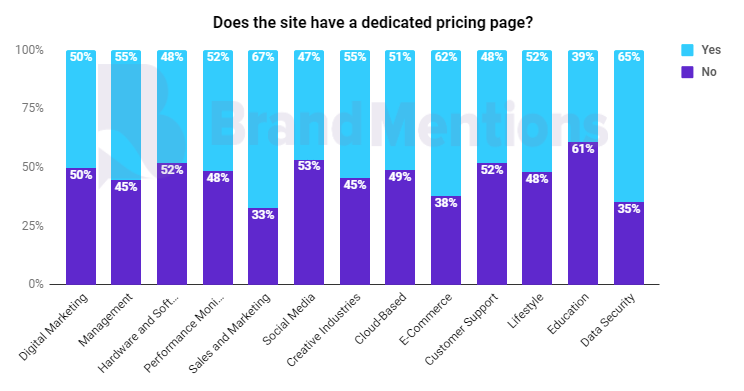 Our results show that while 53% of the websites had pricing pages, just 45% of them had public prices for their product. 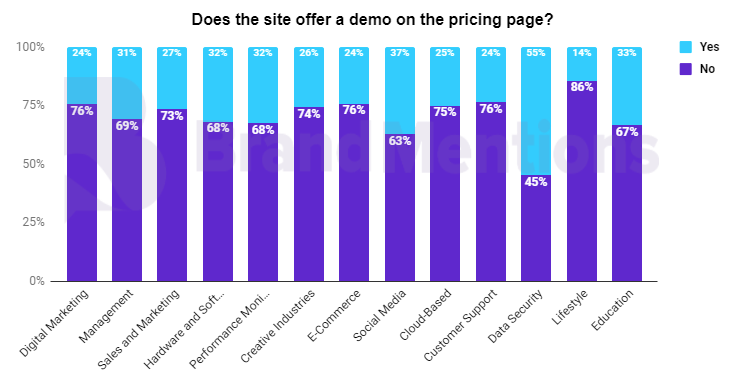 Hold on, you might say, you mean to tell me 8% of these websites have a pricing page that doesn’t actually show… prices? And that’s the thing, actually, a pricing page is more about pricing options, rather than the prices themselves. 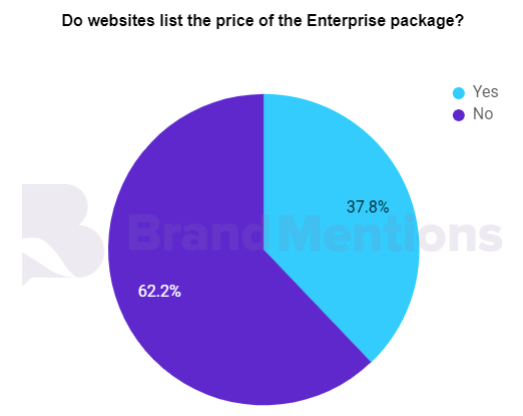 Even of the websites that have both pricing pages and public prices, many of them have categories where the price is not displayed (usually the “enterprise” package). The categories of pricing are the key to these pages, as they’re much more likely to tell the users what to choose, rather than the price itself (which, due to the abstract nature of the product, could always feel higher or lower than it should be). The whole idea of a pricing page is not necessarily about the price itself, but rather about market segmentation. The actual price is less important than factors such as meeting certain criteria, fitting the company strategy or vision, having global capabilities, etc. That epiphany actually makes the content, design and structure of a pricing page even more important than if it were just about the price, since it’s now both a selling pitch and a negotiation. Just how many packages is enough? You’re definitely welcome to try and find the number that best suits you, but of all the websites we’ve looked at, none sets prices packages above 6. So you’ve got yourself an upper limit. For reasons that have to do with logic, as much as strategy, none went below 1 either. Which leaves everything in between as fair game. But perhaps to no surprise, the magic number appears to be 3 – at least for 40% of the websites surveyed. And honestly, we can’t really fault you if you decide to go with that, though you should definitely go for a slight variation of it, if that’s a model that better suits you (or if you want to stand out from the crowd). The newer industries definitely feel more at ease with experimenting, as fields such as Performance Monitoring, Creative Industries, or Social Media display the most variety in terms of the number of pricing packages. So, let’s say you’ve got your doors number 1, 2 and 3 and they’re your pricing packages. Now do you invite your customers to have a peak and try to guide them in the process or do you leave things to fate? Even small things, like the order in which you display these options, can have a significant impact on the decision in certain situations. There’s quite a bit of research on the influence of price presentation order on consumer choice and even though the difference in price between packages is usually significant enough to steer customers on the right track, it’s difficult to argue that in the right context, with 4 or 5 packages where the differences tend to get smaller, there would be no impact to the decision of ordering the packages. Still, most websites are actually pretty straightforward about this. 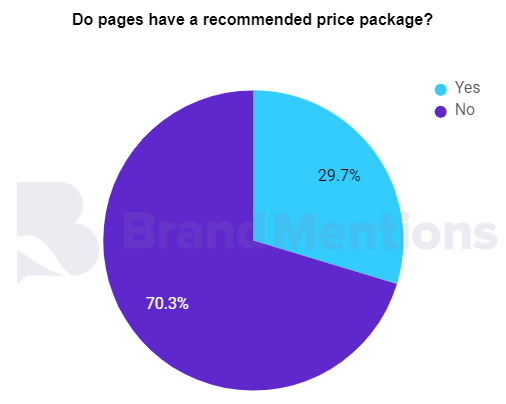 The vast majority of pricing pages (close to 90%) show packages in the order of cheapest to most expensive (when reading from left to right). That’s what conventional wisdom would suggest: ease in visitors so that they are met with the most affordable pricing option and get hooked. Alright, but does this mean that you’re not going to try and nudge your potential clients at all? Not necessarily. You could still present your options in the classic order, but make door number 2 the prettiest and shiniest door there is. Will it fool anyone? Maybe not. Will it make people think about it a lot more? It sure will. But unless you’re really trying to fill in a certain market niche, that might not be a huge concern to you. In the sample we studied, it turned out not to be a widespread practice (less than 30% of the websites had a recommended price), which might suggest that the majority of companies are either trusting that the site visitors will make the right choice, or they do not care enough about the choice, as long as it involves paying a price. 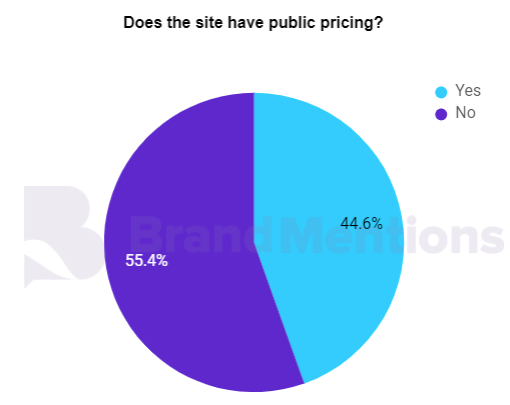 Of all the industries, Creative Industries and Social Media were most likely to recommend a particular pricing package, perhaps because most companies in these emerging markets have very clear and focused target audiences. But what if there’s no door at all? It’s more like a huge room with lots of gadgets and you can take as many as you want and combine them and you pay exactly how much you take. It’s what scalable pricing and pricing add-ons can do. They’re not really widespread practices, but they might turn out to be the way to go in the future. As companies talk more and more about client centricity, even those currently offering ready-made solutions will have to eventually find ways to at least package it in a more appealing way. Pricing add-ons might prove to be the ultimate customization tool and open up markets that weren’t available before, simply because users didn’t feel they fit into any of the available options. Okay, clearly most companies will try to make their middle of the road packages as reasonably-priced as possible (not a low price but not a premium price either). What about the extremes, though – the really cheap and the really expensive? Let’s start at the low end and start with the cheapest of all: free options. Can I use your product but not pay at all if I promise not to use it very much? The answer is “Yes” for about 30% of the websites in our studies, though there was some variety among industries. It’s hard to spot a particular trend though, as there were both old and new fields that were quite magnanimous with their freemium options (Hardware and Software, but also Cloud Based) as there were others that kept this option on the low (Management, but also Social Media). 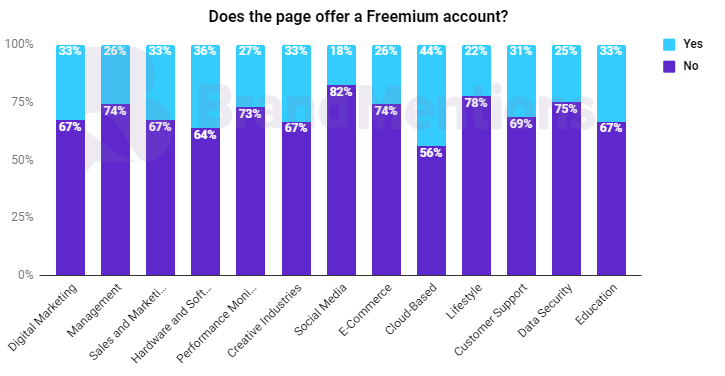 So, the main question when it comes to freemium remains – do you trust those users that they will like/need your product enough to one day make the jump to a paid subscription? Or do you think it’s worth the investment even if they never do? If the answer to either of those questions is “Yes”, you might have enough reason to offer a freemium option. But what if I want to use a regular version of your product for free, but only for a while, to get a better idea of whether I want to buy a subscription or not? That’s what you call a free trial and it’s not really that much more spread than freemium accounts. Overall, a little below 30% of websites are offering this option – which might come as a bit of a surprise if you thought of free trials as a given. It turns out that free trials are actually a minority in all industries, but they are most prevalent within E-Commerce and Sales and Marketing, areas not at all foreign from the concept of sampling. Performance Monitoring and Creative Industries, at the other end, seem to be the fields where this practice has the smallest presence. Probably to be expected of industries that are still quite new and are trying to earn the label of “serious” business. On the other end of the spectrum, big clients spend big bucks, but just how much does that mean? Well, if you have to ask, there’s a chance you don’t have that kind of money, but it might also be that websites usually don’t really tell you upfront. 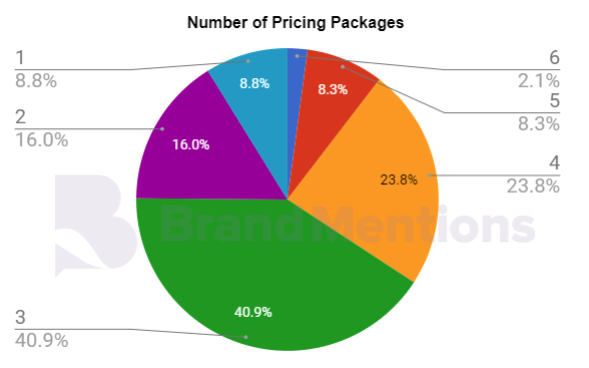 Close to 80% of all websites displayed the highest package cost as “Contact Us”, rather than provide an actual figure. This is likely because the highest priced package is not necessarily a fixed price, but rather a price starting at X and ending at however much the potential buyer is willing to pay. This doesn’t make things necessarily easier – you still need to be very careful about how much you are asking for premium service and how you justify it. But you do have a better chance of making the pitch to someone who can afford it and is willing to pay for it. Three times out of four, the most expensive package is labeled “Enterprise”. While not the only package meant for companies, its name signals a certain expectation in terms of size and scope, as well as the level of customer support that is expected. Most industries, especially the more traditional ones, do not disclose a price for this package, but rather have “Contact Us” as the description. Websites in Hardware and Software for example have an 80% rate of doing this. Newer fields, such as Lifestyle and Creative Industries, are more likely to actually list a specific price (rather than use “Contact Us”), likely in an effort to establish a benchmark in still growing environments. What about the classic marketing tools when it comes to selling things? Does anybody still do demos, testimonials, money back guarantees, or are all these things outdated? It turns out that most of these practices aren’t that common anymore, but some might still be worth the effort. Social proof isn’t as common as one might expect, but it’s still a valuable tool for a third of the websites. It’s difficult to say why this isn’t a more common practice, but it might just be that consumers, in general, have become a lot more skeptical about marketing tactics and are less inclined to trust anyone else’s but their own experience. Things are somewhat similar when it comes to live demos as well. 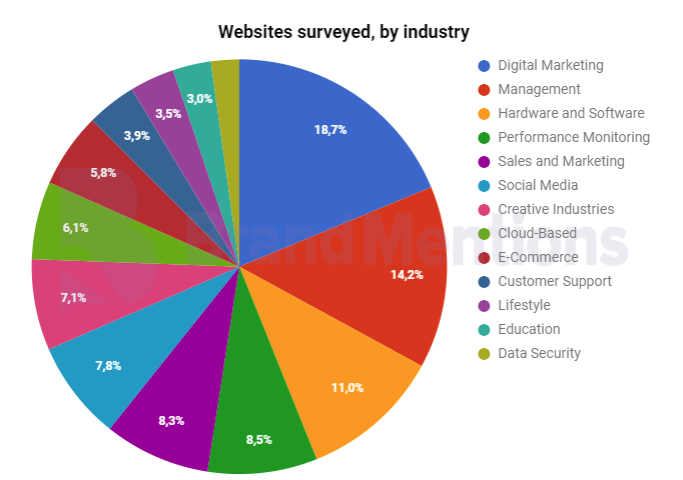 Just a little over a quarter of websites offer demos. Markets which seem to focus most on a demo-approach are Data Security, E-Commerce and Performance Monitoring. It might be that in these fields, to a larger extent than in others, the value of what you’re buying is most easily apparent when you can see the product in action, rather than read specs about it or watch presentations of it. That’s not to say we’ve done away with testimonials altogether, as new industries in particular (such as Cloud-based) seem to find them very valuable in establishing their value in the market. One practice that we may not see much of anymore is the money back guarantee. Most examples of money back guarantee offers were from the Hardware and Software field, but even there, they only represented less than 10% of all websites. It’s difficult to say with certainty who’s the main “culprit” behind the disappearance of this practice, but the smart money is on the rise of affordable packages, coupled with free trial and freemium options, which ultimately make the money back guarantee kind of redundant. Most of the things people make and sell for a living can be divided into neat product units. If you’re a bread maker, every loaf you make will have a certain price which would ideally both cover the expenses for making it and the necessary profit that would ensure you’re left with a decent amount of money for a comfortable living. If you’re a photographer, things get a bit more complicated, but you could still charge by the photograph. Or, depending on the situation and your context, you might choose to charge by the hour. The latter option might also be a popular choice if you’re a lawyer, or any other consulting-based profession. But what if you’re a software developer? The product you’ve developed might have taken a considerable amount of hours to finalize and it might take some hours still if you wish to offer support to your customers. It might also require different resources, depending on the extent to which its users will wish to test its capacities. So, what are the price points now? How do you set the price to maximize profitability? The question becomes less about the actual price and rather about how to communicate the pricing options to your audience. And you have to do this in a way that is easy to understand for your potential customers and gives them enough options to be tempted into buying in (but also guarantees that you will, in the end, be able to cover your expenses and make a profit). Seems difficult? It is. Yet, this is why we came up with this current study; to help you better understand the market you're competing in, to overcome your pricing challenges and to help you craft your perfect pricing page. Within your marketing strategy, you've probably tried dozens of pricing structures to determine pricing that will drastically improve sales. Price skimming, premium price, psychological pricing, predatory pricing, promotional prices, price discrimination, price anchors, penetration price, valuebased pricing, reference pricing, bundle pricing or economy pricing, and the list can continue. You've probably tried several type of pricing strategy (or at least you've read a lot about consumer psychology) with the hope of finding the best product pricing strategies for both you and your customers. The truth is that correctly pricing your products is not easy. But it's a highly important part of your marketing mix. 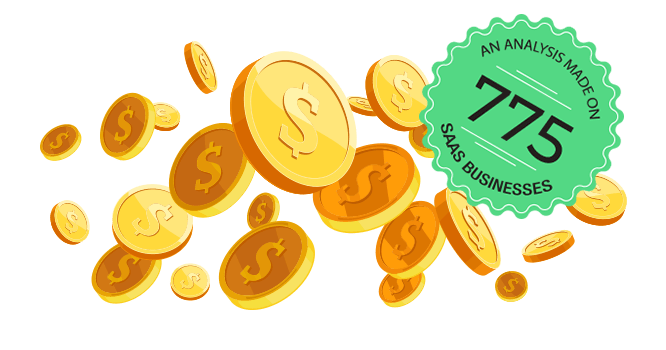 This current research is not the "ultimate guide for saas businesses to improve sales in three days", "the guaranteed for success SaaS pricing strategy"or "the key to SaaS pricing all SaaS customers will fall for." Because honestly, we don't think that such a business strategy even exist. But it's a comprehensive study, performed on a representative SaaS companies that can offer you a competitive advantage in your encounter to determine pricing.